Since the Friday Fitness Ride is already planned, I haven't got anything better to do than remind you about Wachusett Season Ski Passes. 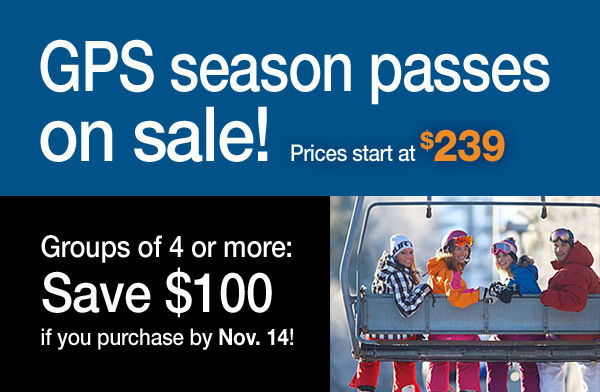 Use the group name ADVENTURIDES, or the coordinator name WILLIAM BRANDT before November 14th and save $100. Anyone interested in a SUNDAY Salem ride? Anyhow, this SUNDAY, November 4th is looking very nice, perhaps a TOP 10, but chilly! Is there any interest in a SUNDAY Salem ride? We won't have to worry about rush hour traffic and the Salem / coastal crowds are probably non-existant. Let me know, and I'll try to work something out. Spouses and older children capable of 31 miles of purposeful riding are welcome. Well, I just got back from a reconnaissance trip to Salem, and other than "Parking $20" signs, everything was wet but undamaged by the Frankenstorm. The edges of the road and many of the bike lanes are covered in wet leaves, so we will need to be especially careful. It looks like Marblehead brought out the street sweepers to clean up the main roads! The weather forecast doesn't look great, but there is a chance it will quit raining by 10:00 AM. I am counting on all of you to aim your massive psychic power toward Salem tomorrow! For those driving, the starting point is well PAST Salem on Route 128. Get off at Exit 18 (Route 22 - Essex St). Take a RIGHT at the end of the ramp onto Route 22, drive about 1/4 of a mile Turn LEFT onto Cole Street. Bear RIGHT at the stop sign, cross the railroad tracks and it becomes Cross Ln. In about 1/4 mile the soccer field will be on your RIGHT. The PortaPotty was still there today. For those who want to carpool, let's meet at Shaw's in Groton at 8:45 tomorrow morning. RSVP. On Wednesday, October 31st - Salem Halloween Spooktacular (Thanks Dewi). 8:45 AM - Carpool from Shaw's in Groton. 10:00 AM - We will leave from Beverly. By popular demand, the morning ride will feature "civilized off-road" along the future (don't hold your breath) Squannacook River Rail Trail. We will visit the Bertozzi Wildlife Management Area and the swimming hole. After a ride along the river behind McDonald's we will explore the other side of the river. The afternoon ride will explore a bit more rugged off-road on the Shirley side of the river. Starting Point Map - Cutler Field (PortaPotty equipped). Route Map - West Groton - Squannacook. Off Road - 2 miles. Equipment - I will do my best to bring my hybrid bike. LUNCH is at the all new and improved Clover Farm Market. The plan is to start in East Pepperell Center, ride to Hollis, climb Federal Hill and stop at the ghost town of Monson Center before zooming down to Milford. From there we will return via the wide shoulder of Route 13 with an optional stop at Chrysanthi's Restaurant for lunch on the way back. The ride should be about 30 miles with at least one Cat 5 hill. Anyhow, if Hurricane Sandy doesn't scuttle my plans, get ready for a Spooktacular ride on Halloween! In the mean time, I have a very nice Fitness Ride planned for tomorrow. We will explore the Vineyard (singular) in Bolton and the Orchards (plural) in Bolton and Berlin. The old church in Berlin has a new foundation, and the hills around Wachusett Reservoir are as challenging as ever. The weather looks good at this point, but who knows. The "SUNNY" skies forecast on Wednesday were very illusive and seemed quite cloudy to me. The Friday forecast calls for Partly Cloudy, light breezes, and low 50's when we leave and Sunny and low 60's when we return. Elevation Gain - 800 feet (more challenging) - 2 x Cat 5 hills. AR Index = Roughly equal to 35 flat, paved miles. Lunch? - How about Bolton Orchards? Well, the weather forecast has changed from iffy to delightful for tomorrow. It should be upper 40s, SUNNY, and a light breeze when we leave. Its should be upper 50s, still SUNNY, still a light breeze when we return. This ride is definitely hilly, but to put in in perspective, if you did both rides Recreation rides on Monday you rode 27 miles with 800 feet elevation gain. 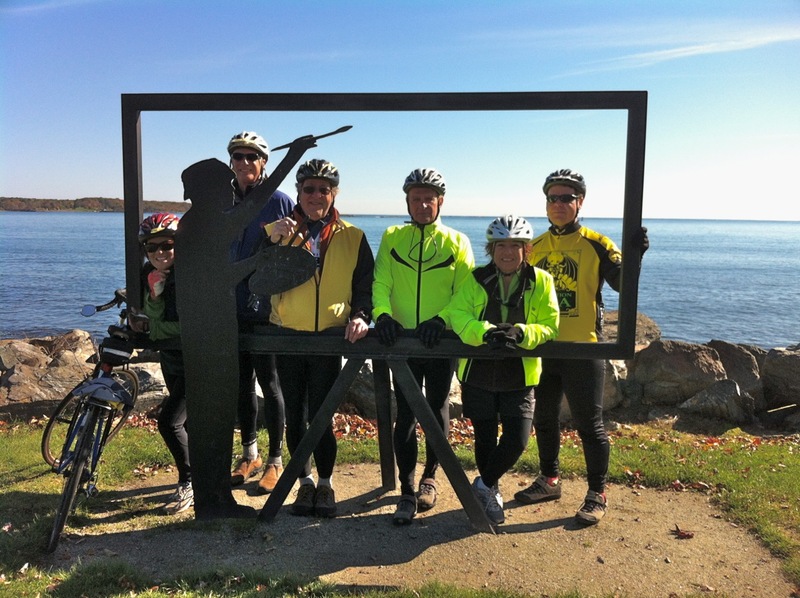 The ride will be about 25 miles and 1050 feet vertical with a category 3 hill (5 miles long, but not real steep) getting up to the plateau, but then its rolling hills and beautiful distant views, "You can see Boston from here". After lunch at Marcus P's Diner Plus, we have a cat 5 hill (easiest category). Its all on road, but there are a few gravel / dirt roads on the way. I plan to bring my road bike. Starting Point Map - Townsend Center. Route Map - Townsend - Greenville - On Road. Elevation Gain = 1050 feet (challenging). Equipment - Any sturdy, well maintained bike will work. I am bringing my road bike. AR Index = Roughly 37 flat, paved miles. For any of you interested in Shaker history, we ran across an interesting video while on our ride this afternoon. The Shakers always embraced the latest technology, but a QR code nailed to a tree at the cemetery??? Anyhow, here is the link for those of you who don't want to scan the QR code. I found another video about Holy Hill. The weather forecast for Monday is looking fantastic! It should be SUNNY around 50 degrees in the morning and still SUNNY and around 60 degrees in the afternoon. It will be breezy / windy, but it is late October after all. The morning Recreation Ride features the beautiful mountain views from Prospect Hill, although there is a category 5 hill (the easiest category) getting up to the view. We will also stop and see lots and lots of goats on our way to Bare Hill Pond. We will stop at the beach and hopefully we won't get thrown out. The afternoon Recreation Ride features the Shaker Villages and Shaker "lollipop" Cemetery. No trip around Harvard would be complete without riding UP Oak Hill, yes, its a category 5, but its not that steep, just long. This is the famous (infamous?) "roller coaster" ride that seems to be more downhill thrills than uphill work. Route Map - Harvard - Bare Hill Pond. Elevation Gain = 300 feet (moderate). Unpaved = 1.5 mile - generally smooth. Equipment - Any sturdy, well maintained bike will work. AR Index - Roughly equal to 15 flat, paved miles. Lunch will be at Sorrento's. We can either drive over or ride over on some back road with just a little time spent on Route 110. Route Map - Harvard - Shaker Villages. Elevation Gain = 500 feet (more difficult). AR Index - Roughly equal to 20 flat, paved miles. The ride will be about 25 miles and 1050 feet vertical with a category 3 hill (5 miles long, but not real steep) getting up to the plateau, but then its rolling hills and beautiful distant views. After lunch at Marcus P's Diner Plus, we have a cat 5 hill (easiest category). Its all on road, but there are a few gravel / dirt roads on the way. I plan to bring my road bike, or at least my road bike tires. Anyhow, I've salvage the beautiful Bolton and Berlin sections and I am looking at some route through Northboro to round out the Fitness Ride. Stay tuned. This year Halloween is on Wednesday, and it occurred to me (duh?) that an Exploration Ride to Salem MA would be really cool! I am planning about a 30 mile ride (its pretty flat) with lunch in Salem. Hopefully the weather doesn't haunt us. Stay tuned for more details. Well, the "Nearly 100% Chance of Rain" for today turned out to be "Nearly 100% Wrong" :-( Anyway, I spent the day exploring Salem / Beverly / Marblehead (warm and dry in my convertible with the top down) for our first ever Salem ride, on Halloween no less! 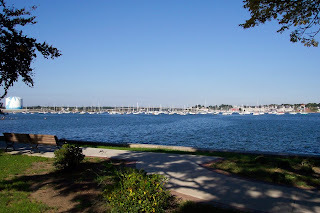 I found many beautiful places along the coast and of course the madness of Salem this time of year. Did you know that Waikiki Beach is in Salem? Hopefully I can find a starting place near 128 and we can sneak into Salem on some backroads and / or along the coast and avoid the traffic jams. Unfortunately the gorgeous weather of the last few days is not supposed to last into tomorrow :-( Even though the forecast says "Nearly 100% Chance of Rain", I will wait until tomorrow morning to make the call. Orchards and Vineyard of Bolton - Beautiful views from Old Bay Road - Old Church / New Community Center renovation in Berlin - Wachusett Aquaduct in Northboro - DOWNHILL on ARRT from Marlboro to Hudson. Elevation Gain - 870 feet - 2 Cat 5 hills. Unpaved - 1/2 mile - very smooth. LUNCH afterwards at Horseshoe Pub with 80 beers on tap, and it's Oktoberfest! The Portsmouth weather for Wednesday is looking very nice! It is forecast to be near 50 degrees, mostly SUNNY, with a WNW breeze (mostly an off-shore cross wind) when we leave. On the way back it should be Partly Cloudy, near 60 degrees, with a light WSW breeze. I am going to move the start time to 9:30 AM so we won't be in a rush. Also, by leaving at 9:30 we can get to Portsmouth before noon and beat the lunch crowd. Pub lunch with fresh microbrew beer (and yummy mussels in butter sauce) at the Portsmouth Brewery. Surprisingly, lunch is not the highlight of the trip! The NH seacoast, the Isle of Shoals, and New Castle are among the most beautiful places in NE. If people are interested in carpooling, RSVP and I will put you in touch with other interested riders. We can meet at Shaw's in Groton to carpool at 8:15 AM. Here is a map. 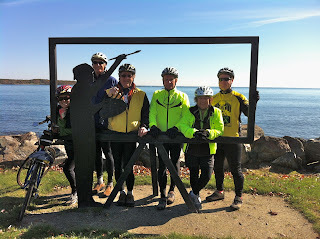 The Exploration Ride will leave Hampton North Beach at 9:30 AM. Here is a map. We will return to Hampton North Beach by 2:00 PM. Let's hope the weather forecast for Monday is wrong since it's calling for a Few Showers in the morning and Thundershowers in the afternoon. At least it's supposed to be warm. I'll make the call tomorrow morning. So far, the weather looks really nice on Wednesday. I am planning our good old 30 mile route along the coast with lunch at Portsmouth Brewery. Unfortunately the glorious weather we had today is not supposed to return tomorrow. It should be in the mid 40s, Partly Cloudy and breezy when we leave. By the time we get back, it should be near 50 degrees with an increasing wind. My shoes have finally dried out after 28 miles with Eddie on Wednesday, so I'm really looking forward to a yummy lunch and adult beverages at the Horseshoe Pub tomorrow! It doesn't look like a top 10 day tomorrow, but 50 degrees and Cloudy when we leave and upper 50s and Partly Cloudy when we return isn't that bad for this time of year. Don't be intimidated by the distance and elevation gain. The first half is pretty hilly, but the visit to the ghost town of Monson Center and the views from Federal Hill makes it all worthwhile. Lunch is at the 27 mile mark and it's mostly smooth and downhill from there. We have 4 hours to do the ride, so our average speed doesn't need to be greater than normal. 12:30 PM - LUNCH at Chrysanthi's Restaurant in Brookline. Route Map - East Pepperell - Milford. Elevation Gain - 950 feet (more difficult - Cat 5 hill going to Monson Center). Unpaved - 1 1/2 miles - generally smooth. Equipment - Despite the unpaved portion, I highly recommend a road bike due to the distance. AR Index - Roughly equal to 45 flat, smooth miles. Elevation Gain - 860 feet - 1 Cat 5 hill. The forecast for this week is generally Cooler and Partly Cloudy. The Fall foliage should start to peak in the next couple of weeks. Its hard to believe looking out the window right now, but tomorrow is supposed to be a very nice day! It should be Partly Cloudy and low 60s when we leave and Sunny and low 70s when we return with just a light breeze. Top 10 day??? We will ride UP on Sunnyhill Road, then DOWN (mostly) to Lake Shirley. Then it's back UP to the alpacas and Hickory Hills Lake. From there it is UP to Bayberry Hill before zooming down to Pearl Hill State Park. Then it's smooth sailing on new asphalt for about 4 miles. After a final UP to the golf course we will cruise back to Lunenburg Center. Lunch at the Bangkok Hill Restaurant. Drizzle and fog :-( Been there, done that. I just checked the Portsmouth forecast, and its been "upgraded" to Cloudy, Chilly, with a NE wind off the water. It still doesn't sound like it's worth the drive, so I've changed the ride to "Blah, Blah, Blah, Filho's". Its the same ride Eddie and I did 2 weeks ago (sorry Eddie). It's 62 degrees and raining in Groton right now, while the forecast was for upper 70s and cloudy. Tomorrow's forecast is for mid 60's and cloudy. I guess we'll see. On our adventure today we came across some signs for "Battle for the Airfield" at the Collings Foundation in Stow. Although I'm not into war reenactments, this one is well done and they take time to explain that war is hell and shouldn't be glorified. Anyhow, this is one of the two times a year that you can visit the Collings Foundation and its aviation and automotive museums. I HIGHLY recommend it. It's a bit chilly this morning and it will be windy this afternoon.